Once upon a time, while The Dingo was planning his lunch, he realized he was out of bread and a couple of other things around the kitchen. So he decided to make a quick trip to the grocery store. As he pulled into the hectic parking lot, The Dingo couldn’t believe how busy it was! He circled and circled around for a parking space and he finally found one at the far end of the lot. He made his way to the front door and he noticed a guy who had just finished unloading his groceries into the back of his car. The same guy started walking the cart all the way back to the store, but The Dingo decided to help him out and offered to take the cart for him. “You are so considerate, thank you!,” said the guy as he handed over the cart to The Dingo. The Dingo just smiled and made his way towards the store pushing the cart in front of him. He walked into the supermarket and parked the grocery cart into the appropriate area and grabbed a small shopping basket instead. As he made his way to the produce section he noticed an employee restocking the oranges and before he knew it, a few oranges had tumbled off of the shelf and began rolling down the produce section. As the employee frantically chased after the oranges, The Dingo jumped into action and helped him catch the remaining ones. “That was so considerate of you, thank you for helping me catch the run away oranges!,” the employee said to The Dingo. The Dingo smiled, placed the oranges on the shelf and continued shopping. 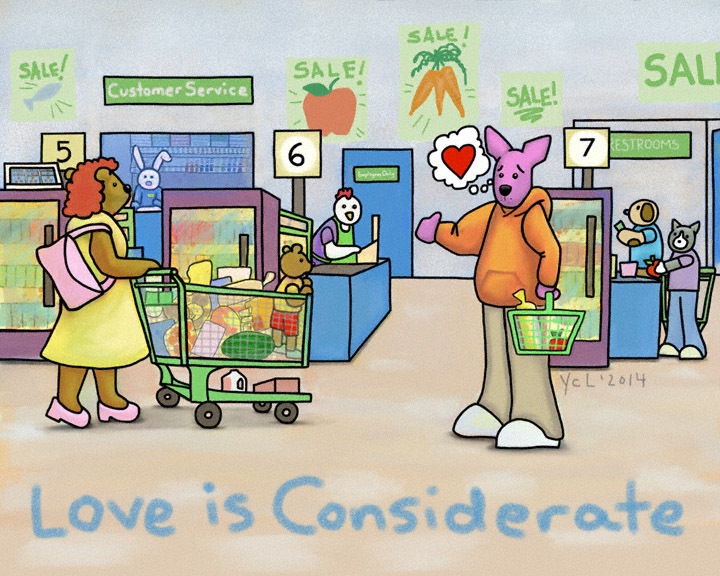 After grabbing the few items he needed, The Dingo made his way to the check out line and to his pleasant surprise a register lane had just opened with no lines and no waiting. As he walked over to the open lane, another customer with a full cart of groceries and a little guy in tow was making her way to the same register lane as well. She really seemed to have her hands full and even though The Dingo was first to the lane, he stepped back and offered her his place in the front of the line. “You are so kind and considerate, thank you!,” she said. The Dingo smiled and waited patiently for his turn. 2: thoughtful of the rights and feelings of othersHe reflected on this definition and smiled. He enjoyed being thoughtful and knew deep down that thinking about the rights and feelings of others is a great way to walk in love. It’s very easy to go through life only thinking about our own needs and desires and we often complain about things that are an inconvenience to us e.g., the far away parking spot, the runaway oranges getting in our way, the long check out lines, etc. , but we rarely stop to acknowledge that there are other people around us dealing with the same issues. So we can either complain or follow the golden rule whenever we can: treat others as you’d want to be treated. The Dingo chooses to walk in love and in the process, he hopes to inspire others to do the same.